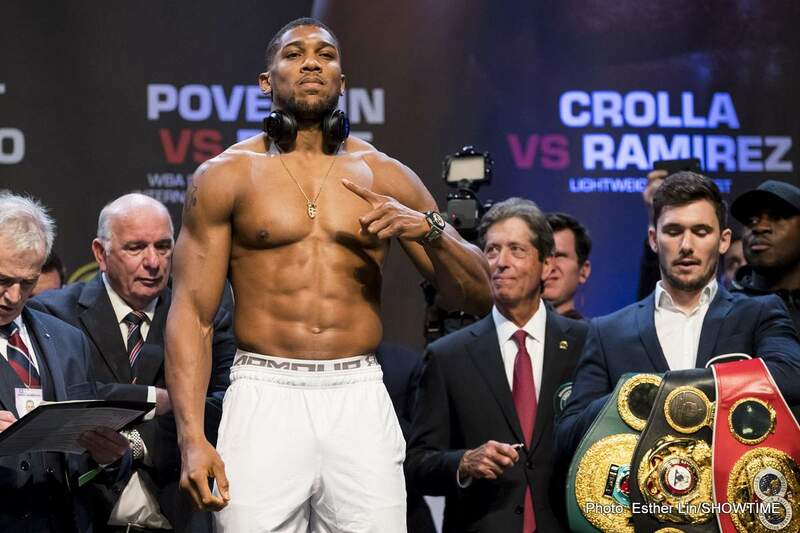 If Anthony Joshua wants to keep his WBA heavyweight title he will have to fight Russian star and former WBA champ Alexander Povetkin in his next fight – unless a massive unification showdown with WBC ruler Deontay Wilder can be made and made quickly. Unification fights trump mandatories, so if the fight we all want to see can be made, Povetkin will have to wait. Speaking with Sky Sports earlier today, Eddie Hearn said it will be either Wilder or Povetkin next for AJ. World of Boxing, Povetkin’s promotional team, took to twitter to call for the fight with the reigning WBA/IBF/WBO champion. “Now there are 150 days to arrange the fight, it must take place. Before the fight with Sasha, Joshua has no right to fight with anybody else. We have 30 days to negotiate,” the statement read in part. While Joshua could face Wilder next, it’s very likely the big, four-belt unification super-fight will have to wait (that is unless Hearn and Wilder’s people can suddenly thrash out a deal) and it will indeed be Povetkin next. Joshua Vs. Povetkin is certainly no dud of a match-up; in fact there will be plenty of fans arguing how the 38 year old Russian puncher will have too much experience for the admittedly still-learning 28 year old champ. Whether it wound up taking place in the UK or in a stadium in Russia, Joshua-Povetkin would be a big deal. Povetkin, beaten only by Wladimir Klitschko at pro level, has won his last eight fights and, apart from being badly troubled in the third-round of his crushing KO win over David Price on the Joshua-Parker card last weekend, Povetkin has scarcely lost a round during this time.